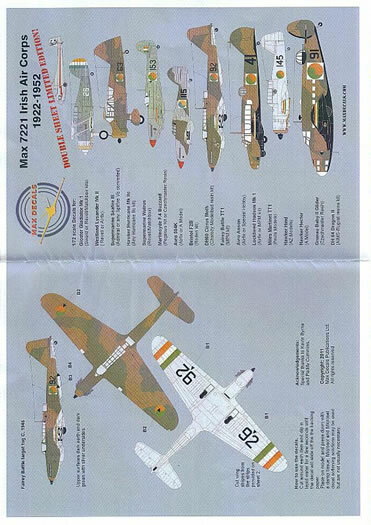 Max Decals has produced a special double sheet of decals in 1/72 scale for enthusiasts of the Irish Air Corps, with markings offered for a remarkable 18 aircraft, many with further variations or changes to the schemes worn. The instructions (all six pages!) 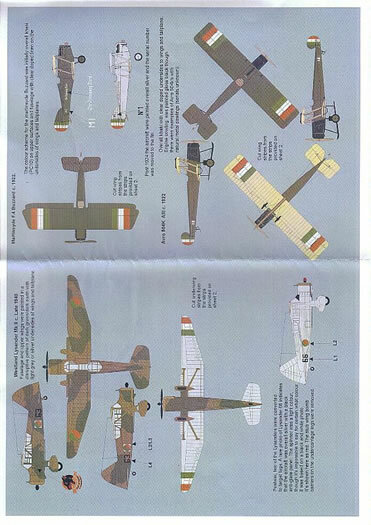 are printed in colour and recommended a 1/72 scale kit for each aircraft or suggest how to achieve the particular version operated by the IAC. 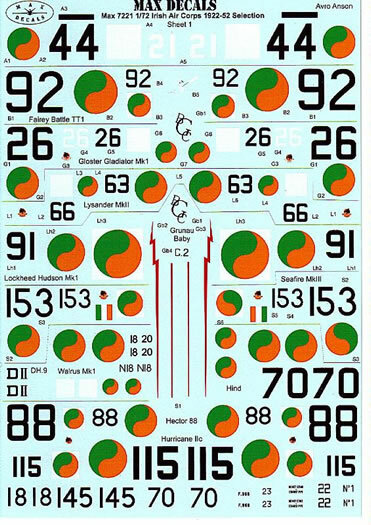 They also give suggestions for the required colours (with cross-reference where possible) and clear indication for decal placement. The decals are superbly printed, are in perfect register and show good colour density. The carrier film is ultra thin. 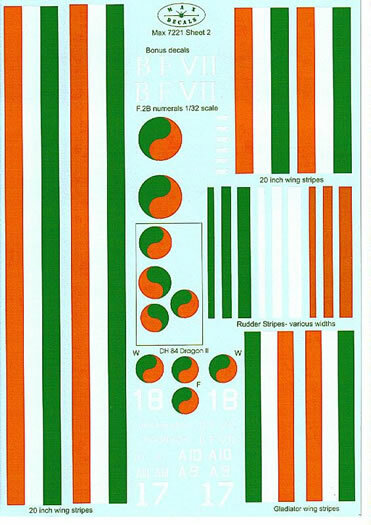 Lengths of wing stripes in the national insignia colours of orange, white and green are provided so that a perfect match with the insignia (if appropriate) can be easily achieved. Additional rudder stripes of various widths are also provided to assist the modeller to achieve perfectly straight demarcation lines with the minimum of fuss. Bristol F.2B; Khaki green and doped linen, c. 1922 or silver and grey, c. 1928. Avro 504K; Khaki green and doped linen, with black or metal cowlings, c. 1922. Martinsyde F.4 Buzzard; Khaki green and doped linen, c. 1922 or overall silver, post-1924. DH60 Cirrus Moth; overall silver, c. 1927. Avro 621 and 628 trainers; overall black fuselage and silver wings and tail, c. 1930 – 1934. Grunau Baby II Glider; overall silver and natural metal, c. 1936. DH 84 Dragon II; mid green fuselage and silver wings, c. 1937 or dark green and dark earth uppersurfaces and silver lower surfaces, c. 1941. Avro Anson 1; Titanine TE348 green fuselage and silver wings, with polished metal cowlings, c. 1938 or dark green and dark earth uppersurfaces and black lower surfaces, 1939 and 1943. 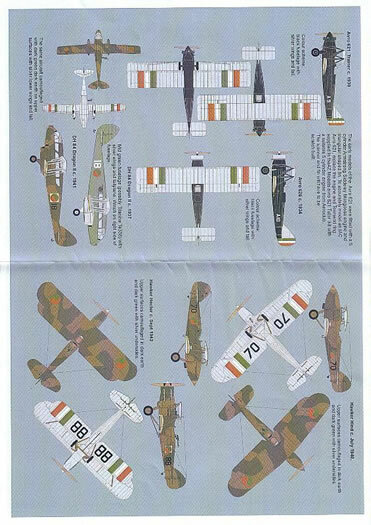 Hawker Hind; dark green and dark earth uppersurfaces and silver lower surfaces, c. 1940. Hawker Hector; dark green and dark earth uppersurfaces and silver lower surfaces, c. 1942. 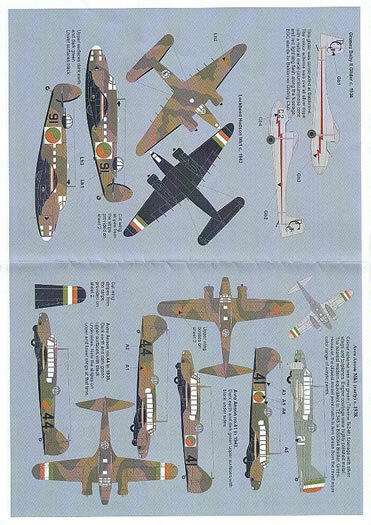 Lockheed Hudson 1; dark green and dark earth uppersurfaces and silver lower surfaces, c. 1942. Gloster Gladiator; Titanine TE348 green fuselage and silver wings, with polished metal cowling, c. 1938 or dark green and dark earth uppersurfaces and silver lower surfaces of the wings and tail, 1940. Supermarine Walrus; overall silver, 1939 delivery scheme or dark green and dark earth uppersurfaces and silver lower surfaces, c. 1940 onwards. Westland Lysander Mk II; dark green and dark earth uppersurfaces and silver lower surfaces, late 1940. Hawker Hurricane Mk IIc; dark green and ocean grey uppersurfaces and medium sea grey lower surfaces, late 1945. 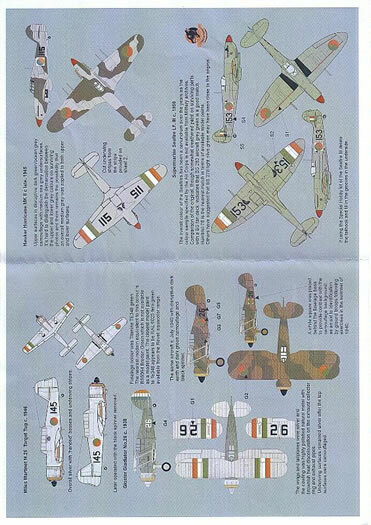 Fairey Battle TT1; dark green and dark earth uppersurfaces and silver lower surfaces, C. 1945. Miles Martinet TT1; overall silver and black spinner, c. 1946. Supermarine Seafire LFIII; overall grey-green with red spinner, c. 1950. 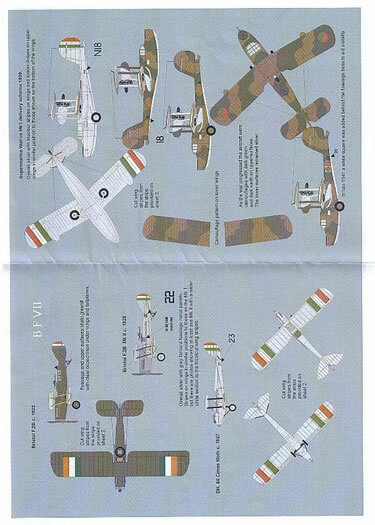 Bonus markings are included for a Bristol F.2B in 1/32 scale, from Wingnut Wings. These markings are highly recommended. Thanks to Max Decals for the review sample.